The Academic Advising Office assists students with the transfer process by helping students navigate the application, explore course and program appropriateness, and research potential 4 year colleges/universities. The office also provides transfer workshops and arranges visitations by four-year transfer representatives from a variety of institutions throughout the year. 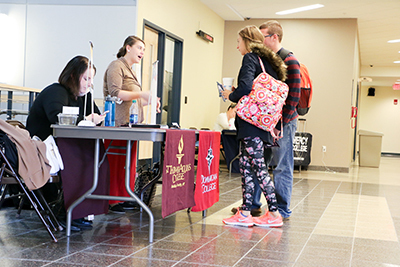 During the College Transfer Fair in the fall semester, the Academic Advising Office invites approximately 80 public and private college and university representatives to campus to meet and discuss their programs with students. When SUNY Orange students transfer, they graduate! Orange students are well prepared for transfer to a four-year SUNY college or university. According to a recent survey, when compared with other SUNY community colleges, our students have the highest persistence rate in completing their college education. What is the SUNY Transfer Guarantee? Transfer directly from SUNY Orange with an Associate in Arts (AA) or Associate in Science (AS) degree. Be a New York State resident. Comply with all specific deadlines. Additional policies and procedures (PDF) (Plain Text). What do I need to do in order to transfer successfully? Academic Advising Office - Stop by to discuss academic programs, transfer options, articulation agreements, and additional transfer information/resources. Faculty Advisor - Keep in contact with your faculty advisor to discuss matters related to your field of study and the potential for transfer opportunities. College Transfer Fair - Held during the fall semester of each academic year. Many college admission reps will be on campus to assist students in transferring. Monitor our Transfer Fair page as we get closer to the fall for more information on this. Associate in Applied Science degrees are designed to develop professional/technical skills for career entry, yet it is possible for a student to transfer with this degree. Additional general education courses, if needed, may be taken at the four-year college. Where have SUNY Orange students gone? Boston University, Cornell University, East Stroudsburg University, Fashion Institute of Technology, Fordham University, Hunter College, Iona College, John Jay College of Criminal, Justice, Long Island University, Manhattan College, Marist College, Mercy College, Mount St. Mary College, New York Institute of Technology, New York University, Nyack College, Penn State University, Ramapo College, Rensselaer Polytechnic Institute, Rochester Institute of Technology, SUNY Albany, SUNY Binghamton, SUNY Buffalo, SUNY Cortland, SUNY Geneseo, SUNY New Paltz, SUNY Oneonta, SUNY Oswego, SUNY Plattsburgh, SUNY Purchase, SUNY Stony Brook, Syracuse University, and many others.